into late winter’s violetting dark. flex below to an avalanche of falls. isolated, chill, in the brilliant hush of snow. Once, these woods summered us in green. Now alder’s frost-bowed, weighted under white. bobbing on a black rock compromised in ice. Ponderosas plunge to a frozen halt. Snags seared by lightning thrust snow-blind. Mauls of wind crack everything apart. You move away, to crumbling river’s-edge. I shiver on a ledge of cold. paired geese wing and cry here, home. its scarf of song. Each branch its load of beauty. Our hands a bridge to cross the coming night. This poem first appeared in Clackamas Literary Review (Spring 1998). Judith H. Montgomery lives in the High Desert in Bend, Oregon, where she writes and tries to keep deer from eating her geraniums. Her poems appear in a number of journals and anthologies and her first collection, Passion, received the 2000 Oregon Book Award for Poetry. 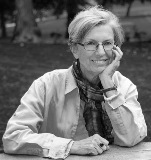 Judith loves to teach and talk about poetry, is the author of three collections, and is working on two new manuscripts. Beautifully written poem, loved it. Beautiful language and picture created. Judith, I like the whole poem and I like especially your use of alliteration at various points with your creation. Marvelous piece. Thank you. Very lovely; the detail is superb. Beautifully sequenced. Like viewing a painting, there is more to see, more nuance with each reading of this fine poem. Makes me feel like I entered a sanctuary. Beautiful poem. Thanks, Judith. Their scarf of song! How lovely. I enjoyed this poem so much. Thank you Judith.